I retired the Personal Branding Award series a few months ago and said I was going to start a new series…. well, this is it. I want to interview people who are doing something DIFFERENT. There is an irony I live with every day. Some people think I am hear to help you land your next gig… to find your dream job. You see, I personally don’t think a dream job exists… not in the way it did a few decades ago. Even if you find the dream job you might not have it after 6 months or 6 years. You are always in transition, always a job seeker, and thus, always CEO of Me, Inc.
Part of that, as I’ve mentioned before, is to figure out personal income security. Welcome the first person in the series – Gary Vaynerchuk (aka, GaryVee). Gary is beyond a rockstar, although he’ll deny it. His energy makes me think all I’m suited for is a government job… but he claims it is not the craziness or energy that makes you WIN. No, not win, that makes you CRUSH IT! Crush it is the name of his new book, which should start shipping today. 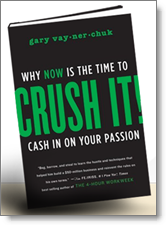 I interviewed Gary for about 45 minutes, you can listen on the BlogTalkRadio channel. Lots of gems to apply to your own career here. And check out his book Crush It – it’s less than $15 at Amazon. I’ve got mine in the mail and I’m anxious to get into it! Well, I think dream jobs exist (hey — I’m writing “I’ve Landed My Dream Job — Now What?? ?”), but you are correct in that the circumstances surrounding the job can change. Quickly. It’s one of the reasons that when you go into a new job, you need to make an assessment of how long the job will last so you have a baseline to evaluate changes. I can’t always squelch the chuckle that escapes when I am talking with a client/candidate and they start to describe “what they are looking for, their next perfect job.” I laugh because I agree with you that it is unlikely to land a corporate position today that meets every single expectation that a prospective employee may have at any given time. However, as @Careerealism proselytizes, every job is temporary. On the other hand, the corporate me is forever. A new mindset needs to be established wherein every workerbee accepts that they have to take personal responsibility for their career and making their work life satisfying. Getting back to my giggles…….I started my consulting practice, JobWhiz, Executive Talent Agent, as a solution to satisfy my own list of what represented my own ideal career/job. It is truly my passion to help senior level executives establish connections to new career challenges that match their selection critieria. I created a job for myself and love assisting others to define their employment goal and then build each client a network to source the perfect job lead via personal introductions to the decision makers who need to know their potential value to an organization. Jason, if you are interested, I am volunteering to share my success. I am lucky enough to have created a job for myself that is so wonderful, I never feel like I am working!